Bolchazy-Carducci: Latin for the New Millennium: Student Text, Level 2, 1st Ed. 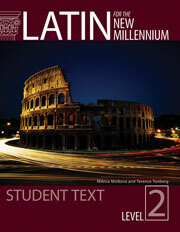 Latin for the New Millennium, Levels 1 and 2, Second Edition, is available. It you are using the 1st edition and need additional copies for your classroom please allow 6-8 weeks for delivery. For information on what’s new in the Second Edition, click here. This complete introductory course to the Latin language, suitable for both high school and college students, consists of two volumes, each accompanied by a teacher's manual and students' workbooks. The strategy employed for teaching and learning incorporates the best of both the reading approach and the more abstract grammatical method. The choice of vocabulary in each chapter reflects ancient authors commonly studied for the AP* Latin examinations. There are exercises designed for oral use, as well as a substantial core of more conventional exercises in each chapter. The readings, pictures, and supplementary inserts on cultural information illuminate Roman life, civilization, Roman history, and mythology, as well as the continuing use of Latin after antiquity and its vigorous literary tradition in such periods as the Middle Ages and Renaissance. Each chapter also includes derivatives, the influence of Latin vocabulary on English, and selected proverbs or common Latin sayings. Latin for the New Millennium Companion Website: this website has additional information about Latin for the New Millennium including a "Teachers' Lounge". The teachers' lounge is a forum for teachers using and interested in using Latin for the New Millennium series textbooks, workbooks, and enrichment texts. These sample pages are PDF documents for viewing only, they can not be printed or copied. At first glance, compared to other popular Latin textbooks, the cost of Latin for the New Millennium (LNM) might lead to comments, such as that of a colleague, who recently assured me, "You can get everything you need" in another Latin grammar text for about a third of the price. Certainly more inexpensive Latin textbooks are available. However, if a textbook motivates students to read and learn with interest and understanding, the book is worth the price. Last year, I assigned LNM Level 1, to my Elementary I and II Latin students. Unlike many of the students in the Intermediate Latin class, which was using a different text, the Elementary Latin students were eager to delve into the chapters. For example, every two weeks I would assign a quiz game in which each team of students had to create ten challenge questions from a unit of LNM for opposing teams in the class. The questions had to be drawn from specific sections of the chapters, such as the introductory reading passage in Latin, the grammar explanation, the English to Latin sentences, the dialogues, vocabulary, and information about Roman culture in the chapters or at the end of each unit. At the end of the exercise, for additional points, each student handed in his or her cards with the questions, answers, and page numbers in the textbook where they found the answers. This exercise was so popular that students requested it more often. At the end of the 2011 spring semester, one section of Elementary Latin II was asked if they would like to continue with LNM or switch to another textbook. They voted for LNM, so this fall, my Intermediate class, including those former Elementary Latin II students, will adopt Level 2 of LNM. What makes LNM appealing to students? At first glance, it draws readers in, with clear, large font, straightforward explanations, and brightly colored scenes from Italian cities and images from Roman artifacts and architecture, evoking a sense of exploration, entry into a world where Latin is yet alive, where people read, write, speak, and live the language. The book takes an interwoven approach to the skills needed for meeting the standards of proficiency in language acquisition: reading comprehension and translation, composing and speaking Latin, and Roman history and culture. Each chapter begins with a short passage for reading and translation, adapted from a primary work by a Roman author. The readings are also arranged chronologically, so that, in Level 1, students are introduced to key events from Roman history, starting with the story of Romulus and Remus, and moving through authors from the Republic and Imperial eras. Level 1 also introduces students to the genres of Roman literature, including short dialogues adapted from Plautus and Terence; prose excerpts adapted from Cicero, Caesar, Nepos, Sallust, Livy, Seneca, Pliny the Younger, Tacitus, Apuleius, and Ammianus; and prose adaptations from the poets Catullus, Ovid, and Vergil. The book closes with excerpts from Augustine and Boethius that provide a transition to the study of Medieval Latin. Level 2 provides an introduction to later authors, including prose and poetry, drawn from Medieval and Renaissance/Humanist Latin, with emphasis on the transmission of Roman influences on the later liberal arts and sciences in European and New World cultures. Authors, arranged chronologically, include Bede, Einhard, Heloise to Abelard, Petrarch, Lorenzo Valla, Erasmus, Thomas More, Juan Gines de Sepulveda, Copernicus, and Ludvig Holberg. Level 2 also includes practice with unadapted Classical Latin: ten sections from Cornelius Nepos on the life of Cicero's friend, Atticus. The chapters in Level2 can be supplemented with readings from earlier texts in classical Latin, such as Cicero's letters and orations, Ovid's Metamorphoses, and Vergil's Aeneid, as well as other authors, such as those from Level 1, on parallel themes. A glossary of unfamiliar words and phrases accompanies each reading on the facing page, and following the readings are comprehension questions, explanations of the grammar topic of the chapter, carefully represented in the reading, and composing and speaking exercises to reinforce grammar and vocabulary. Students enjoy reading and even acting out the dialogues, which can also serve as models for new dialogues of the students' own composition. Chapters are interlinked in a progression, so that previous material is reviewed while new material is added in the readings and in the exercises. Cultural information relates to the readings, and, at unit ends, essays by prominent classicists provide additional background. Thus from both levels of the textbook, students gain linguistic skills and cultural background with an introduction to texts adapted from primary authors. This is one of the greatest strengths of this series, in addition to its emphasis on applying Latin both in speaking and in writing. Students can be assigned to research background on the authors of the reading passages, and also locate their original Latin texts, and thereby begin to learn as classicists do, from surviving evidence. In this way, LNM serves a double purpose, in that it teaches both about and from primary texts, opening many pathways for further exploration and learning of Latin. These textbooks are supported with excellent ancillaries: teacher's guides for both the textbook and the workbook, and an online teacher's lounge. The authors have provided a wealth of exercises, more than can be covered in each chapter and unit, given course time limitations, but this abundance has an advantage: teachers can select what they need or create their own exercises following the examples in the textbook. This summer (2011), an online version of the text is being made available at a slightly reduced price, a welcome addition, now that digital media are becoming a common alternative to the printed page. As with any textbook, especially in its early editions, there are a few minor issues. When LNM 1 was first released in 2009, it was shortly followed by an updated version. The earlier version is, for the most part, no longer in circulation. However, if students are purchasing used books, some may obtain the earlier text, and as a result, find differences in the content of exercises. The glossary at the end of LNM 1 could be more comprehensive, to include words in the practice dialogues, in addition to the vocabulary from the reading passages for each chapter, which are carefully glossed in both Latin-English and English-Latin sections. However, a positive feature of the chapter glossaries to reading passages is that words to be memorized are starred. And finally, the index to the book could be more consistent; at times it is more efficient to look up specific topics, such as verb conjugations, by leafing through the table of contents than by consulting the index, which lists declensions with page references under "nouns," but under "verbs," conjugations are not listed. On the other hand, declensions and conjugations are also indexed under their own respective headings, which is helpful. Overall, LNM is student-friendly, and excellent for courses in which the goal is to introduce students to the multiple modes of language learning, together with a history of Roman culture and the spread of the Latin language, through excerpts from primary texts, adapted to the level of the students' proficiency. In response to the evaluation question, "What impact did the learning resources of the course (e.g., classroom facilities, media, computers, printed materials, texts) have on your learning?" two Latin 101 students responded thus: "The book was very helpful," and "The book for the course was resourceful and had examples that helped me comprehend the structure of the language easier." What more can a teacher ask of a textbook? It has been so much fun to teach my students with Latin For The New Millennium II. The basics are all there-uses of the subjunctive, comparative and superlative adjectives and adverbs, irregular verbs, extensive vocabulary, etc.-BUT what really sets this book apart is the way Dr. Minkova and Dr. Tunberg have walked the students through the centuries beyond the Roman Empire. The students follow Latin's survival through the Middle Ages and then its influence on the Renaissance and beyond to the Age of Exploration and Discovery. How exciting to not just tell students that the Latin language has impacted western culture but to be able to let them read and understand for themselves how this really happened! The selections from authors such as Bede, Petrarch, Valla, and others, and the background information at the beginning of each chapter lead the students through the preservation and progression of the language over a thousand year time period. My students especially had a lot of fun with the medieval pubs and the Carmina Burana! The chapter readings and the class discussions these initiated have helped the students in both their world history and U.S. history courses and also in their art and music classes. LNM II is a visually engaging book with beautiful artwork and photography. The on-line support for the teacher is exceptional and I especially like the workbook for reinforcement for the students. This is certainly not your mother's second year Latin book! Latin for the New Millennium: Student Text Level 1, 1st Ed. Latin for the New Millennium Level 2 video demonstrating the content of this introductory Latin series. Latin for the New Millennium: Student Workbook, Level 2 - TM, 1st Ed.